There has been a wide variety of email clients and users in recent years. Lotus notes and Microsoft outlook are two such email clients which are popular amongst its user and are used at an organizational level. Lotus note is email client software used by IBM as IBM Notes (LOTUS NOTE) or as IBM Domino. Lotus Notes is one of the most vital assets in IBM organization. Although Microsoft Outlook is considered to be one of the ideal clients in business as well as for other mailing services, on the other hand, Lotus notes are only valid for business purpose. This is all due to the no of applications provided by Lotus notes other than the services it provides for business emails and thus requires a high maintenance cost. The lotus notes are on the verge to lose it popularity this is due to Microsoft outlook over growing popularity amongst it user, upgraded set of features it offers and low maintenance cost. Thus many of the Lotus Notes email clients are shifting their domain to Outlook environment in order to experience facility which is far more efficient than Lotus notes and to reduce their cost of maintenance. Microsoft recently introduces some of the latest version worldwide like office 365 and outlook 2016 which has gained an immense popularity amongst its user. The earlier version of Microsoft Outlook was also an asset to the organization such as Outlook 2013 and Outlook 2010. Better accessibility and data sharing: Better accessibility and data sharing: Lotus notes provide highly technical emailing access which can only be operated by technical users and does not share data on another platform easily as it is only accessible for IBM client whereas outlook is comparatively simpler than lotus notes, to an extent that even a non-technical users can operate it efficiently. Since outlook its very common platform with the wide variety of user, therefore, the data sharing is very easy to other platforms as well. Offline accessibility: One of the additional benefits in working in outlook is that the users can even work in offline mode and the data will reconnect to the server once the internet connectivity is available which is not possible on Lotus Notes. The most problematic situations lay with Lotus Notes to Outlook migration. Since the manual method of migrating NSF to PST comes with migration issues. The chances of data corruption and data loss also arise when the data migration of Lotus to Outlook is done manually as the manual procedure does not guarantee full recovery of data. Lotus notes only allow the migration of Lotus Notes to Outlook contact: The lotus notes only allow the migration of Lotus notes contact in the form of.CSV (comma separated value) files which can further be imported to MS Outlook PST. Through this Lotus Notes can easily be migrated to Outlook PST but Lotus notes are unable to transfer or migrate data for NSF to PST like emails, calendar, attachments, etc. One of the most common Lotus Notes to Outlook Migration issue is that Microsoft Transporter Suite has been imposing with the size limit on the Lotus Notes database that needs to be migrated to Exchange server. In case the Lotus Notes database exceeds this size limit, the error will appear that the maximum limit has been exceeded. Therefore, large data migration of Lotus Notes to Outlook database is also not possible using the manual method. The Lotus Notes to Outlook Migration issue cannot be overcome by the use of a manual method. The manual method of Lotus Notes to Outlook migration is not a reliable solution as several problems might occur when you are attempting the manual migration. Also, the user should a deep technical knowledge about the methods and error. Third party software tools are simplified and do not provide any complexion during Lotus Notes to Outlook migration. They are easy, reliable and can be used even by nontechnical users. The algorithm of this software is designed in such a way that they do not consume much of user time and can quickly resolve Lotus Notes to Outlook migration issue. Following are the steps through which the Lotus Notes to Outlook is possible with ease. 1. Installation: The user needs to download the software set up and run on their respective systems. 2. Adding NSF files into the software: After installing the software open the software program. Now, the user needs to select the desired NSF files and add through the browsing option provided to the user and fill all the necessary details the software ask the users to. 3. Exporting NSF to PST: The third step of the third party is very crucial and important. This step allows the user to directly migrate NSF to PST. After the NSF file is migrated into Office format by fulfilling the various criteria mention in the export process which will start converting NSF to PST efficiently without altering its original data. The additional feature that this software provides is that during the migration (export) of NSF to PST the user can export NSF files in multiples or as the single file. Lotus Notes to Outlook Migration software tools does not alter the original data during migrating. This means that it will not modify any original structure of data. 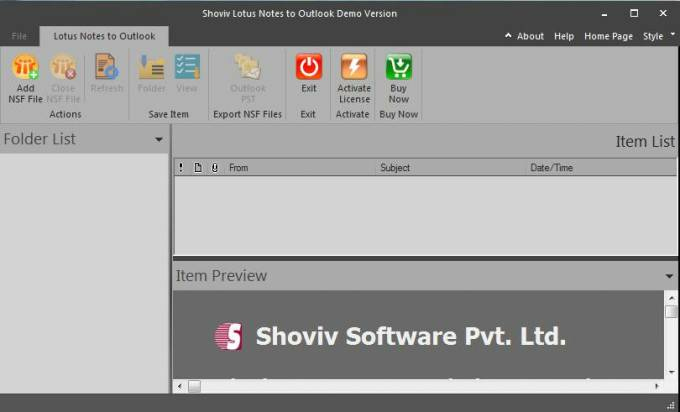 Lotus Notes to Outlook supports multiple no. of migration of NSF mailbox files to PST file format. In Case the User wants to access oversize NSF files then the software provides the users with the option to split the files in accordance to its size and dates. The NSF to PST is a time-saving utility as it allows migrating NSF items. While migrating they provide the option to select particular NSF data for migrating it to PST while dumping unnecessary items. Lotus notes to outlook Software is capable of supporting all the version of MS Outlook such as Outlook 2007, Outlook 2010, Outlook 2013, Outlook 2016 and also IBM notes. Thus, the third party software tools act as a reliable asset in the process of lotus notes to outlook migration. Therefore, the technical expertise always suggests on using third-party software tools as these are simple, easy and time-saving. The free demo version of this software tools are also available which acknowledge the users about the procedure and necessary details on Lotus notes to outlook migration. The free demo provides the user with a free conversion of 25 items from NSF to PST For more information the user can go through the below link.